Synopsis: This article aims to introduce the concept of variation to those who are new to continual improvement and process behaviour charts. All processes, whether natural or man-made, display variation. Let's consider the example of a car journey you take regularly. Even when there are no obvious obstacles or difficulties on your way (e.g. road accidents, extreme weather conditions etc. ), the journey will take you a certain length of time give or take a few minutes. It would be extraordinary if the journey took you exactly the same amount of time, to the minute and second, every single day. We all expect to see a certain amount of variation in the world around us. It is part of what we consider normal. The causes of variation in any given process or system are many. This multiplicity makes it difficult to isolate precisely the one cause or combination of causes responsible for the dynamic, unless you run some form of experiment. It is possible that one cause is responsible for most of the variation. Or it may be that the interplay of many causes has produced that particular outcome. Going back to the car journey example, if you have encountered a bad road accident along the way, your journey on that particular day will be a lot longer than usual. In this case, you will attribute the bulk of the delay (or variation) to the road accident. Most of the time however, the few minutes or seconds that are added or subtracted from the average duration of your journey can be explained by a combination of factors including the number of cars on the road, whether you caught the red or green light at this or that junction, how rested, alert or confident you felt at the wheel on that particular occasion etc. These factors will interact with each other along the entire journey, influencing its duration. Variation does, of course, crop up everywhere in work processes and organisational systems, be they production lines in manufacturing plants or human interactions in service industries. In the early 1920s, Bell Laboratories in the USA had exactly this type of challenge to deal with. They needed to solve a reliability problem in their telephone amplifiers. These are pieces of equipment that strengthen the signal in long distance communication. They were part of an underground network and were required to be placed one mile from each other along telephone lines. The continuity of the network depended on the amplifiers. The problem was that they were breaking down a lot. And since they were buried into the ground, replacing them was expensive. Bell Labs put significant effort into making their amplifiers more reliable, but without success. That was until they assigned the task to a physicist and statistician called Walter Shewhart. He was able to solve the problem when (1) he realised that the manufacturing process displayed two different types of variation and (2) he devised a method for telling one type of variation from the other. This enabled the Bell engineers to take the correct action, which massively increased the reliability of their amplifiers. Routine variation, also called common cause variation, is inherent in the way a process or system runs. It results from the interaction of causes that are commonly present within the process or system. Routine variation falls within a predictable pattern (like your car journeys that stay within the duration limits that you generally expect). Predictability is vital to businesses, because it is the basis for many internal decisions like staffing levels, stock control, project management etc. and ultimately the basis for every promise made to customers. Exceptional variation, also called special cause or assignable cause variation, does not follow a predictable pattern. 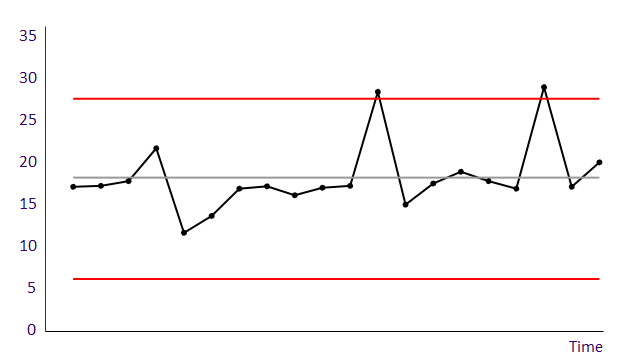 Exceptional variation is a signal that the process is changing over time. Too much special cause variation in an organisation makes managing difficult or impossible, as there is no basis for predicting outcomes and planning ahead. 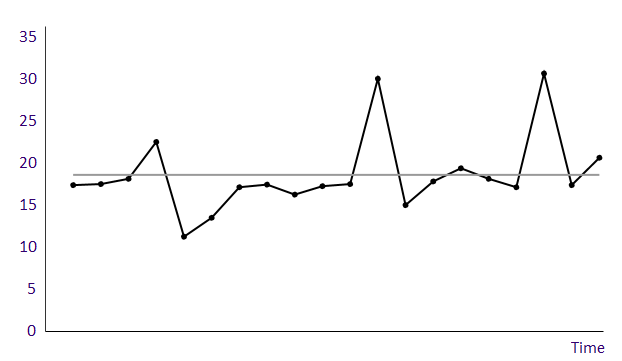 The two graphs in Figure 1 and Figure 2 represent two different processes. Let’s say the horizontal axis of each graph represents a timeline, while the vertical axis records a performance measure, e.g. the quarterly revenue achieved by a business, or the number of patients treated in a hospital department each week, or the number of days an insurance company takes to process each customer claim. If we knew which of the points on either of this graphs represent exceptional variation, then we'd know if the process is predictable and what kind of action we need to take to improve it. How can we tell the two types of variation apart? Walter Shewhart worked out a method for calculating the boundaries or limits within which a process can be safely considered to be predictable or “in statistical control”. We call them natural process limits. 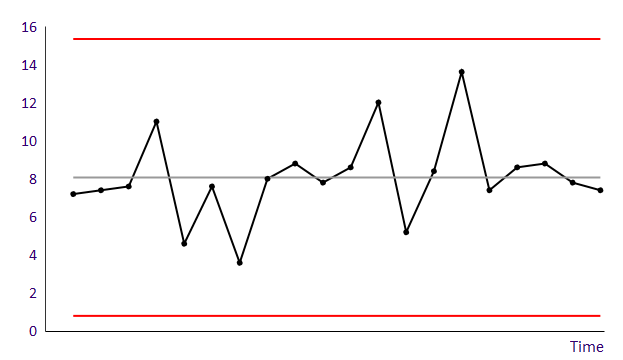 Figures 3 and 4 below show the same process charts, this time with the natural process limits drawn in red. Within these limits, any occurring variation is highly likely to be routine or common cause. The points falling outside the natural process limits represent exceptional variation. We can now tell that process A is predictable, with all the points falling between the upper and lower natural process limits, while process B has points outside the limits, therefore it is unpredictable or, in traditional continual improvement terminology, “out of statistical control”. Note: The terms “predictable” and “unpredictable” are now preferred to “in or out of statistical control”. By the same token, “process behaviour chart” is preferred to the more traditional term “statistical process control” or “SPC”. Each type of variation calls for a radically different type of action. 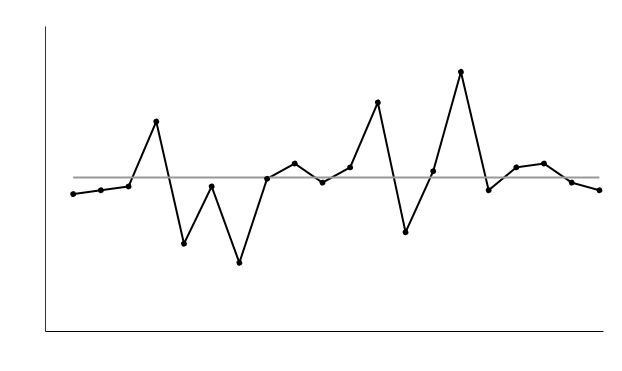 When we detect exceptional variation, it is profitable to identify the factor that knocked the process out of its predictable pattern of behaviour. Once we know what that factor is, we can take the necessary steps to eliminate it and the process will return to being predictable. When a process displays routine variation only, chasing individual causes will be a wasteful endeavour. This is because the behaviour of a predictable process is dictated by the interplay of a multitude of causes, each of them having a small net effect on the outcome. So cancelling any of the small net effects will not make a significant difference. However, we may still want to reduce the amount of variation in a predictable process. Taking appropriate action, in keeping with the type of variation we want to address, is critically important. It will make the difference between competent management and man-made chaos. Too often in real life managers react to routine variation as if it were exceptional variation, not only wasting time and resources trying to alter factors that, individually, have little impact on the outcome, but also – what is worse - destabilizing predictable processes. The effects of destabilising processes that otherwise would be predictable can be dramatic and will affect essential areas like customer satisfaction, staff morale and ultimately business profitability. How can we improve a process that displays only routine variation? A process may be predictable (i.e. subject to routine variation only), but not satisfactory in terms of meeting customer expectations. If the variation is too wide, e.g. customers are waiting too long to be served, or the number of complaints of poor service is too high, then steps need to be taken to reduce variation in the process. The way to improve a predictable process is to go back to the drawing board and overhaul the entire process or system. The aim of the exercise is to identify and design out of the system delays, rework, bottlenecks and any tasks that do not add value for the customer. Identify exceptional variation and remove the factors that cause it. This will, in most cases, bring the process to predictability. If it hasn’t, this initial step needs to be reiterate till all causes of exceptional variation have been removed. Once the process has become predictable, an assessment can be made as to whether it operates satisfactorily or not. Improve the process by reducing its routine variation. This requires a longer term view. This type of effort holds the greatest opportunities for improvement and it can be reiterated indefinitely, hence the term ‘continual improvement’.